That did it. Alice put a group together and they created PAMBE Ghana. Linda offered to do a global fair trade market for PAMBE Ghana nine years ago. Her volunteering commitment to PG continues as strong as ever. Linda still brings a wealth of talent and experience to our organization. She coordinates the Global Market, including overseeing the buying of merchandise from Fair Trade organizations and training of volunteers. Linda also serves on the Public Relations and Marketing committee of PAMBE Ghana. Linda has worked with Fair Trade since the 1980’s. She developed a strong interest after she heard Sister Leona Leucke from the Peace House speak to the local weavers guild about her work with weavers in Guatemala. The weavers were widows and mothers selling their work to support their families. After the inspiring talk, Linda and Anne Murray started buying yardages and selling them at coffee shops, churches, and parties in homes. They collected $200 from local weavers to get started with the project. When they returned, they kept selling until everyone they knew had as much Guatemalan stuff as they could use or give away. So, they expanded to a “Market Day” concept. They got Oklahoma State non-profit status and bought through Fair Trade groups, which had developed in the decade since they first heard Sister Leucke. They used the proceeds to benefit different groups, such as a school in Nepal and artisans in Haiti. And they always sent something back to Guatemala. Linda and Anne went on to help World Neighbors with their Fair Trade gift shop, coordinating and keeping it stocked and organized. Eventually, Linda worked for World Neighbors in their publications department, while still doing the shop. 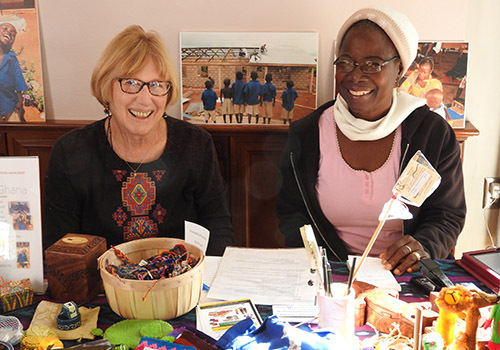 She and PG Board Member Patti Tepper-Rasmussen, did the purchasing for their annual “World Fest Market.” When World Neighbors decided they no longer needed their help, they shifted energies and converted it to the PAMBE Ghana Global Market. Linda’s drive to help others is a value instilled in her by her parents. Her parents were activists, taking up for the rights of others and taking care of those in need. As a high school student, she witnessed these values in action, as her parents, especially her mother, became more involved in civil rights and feminist issues during the 1960s. They also fostered many children over the years. After graduation from Muskogee High School, in 1964, Linda attended OCU on an academic scholarship. She was an elementary education major, which was selected for her by the administration. After student teaching, she realized that she didn’t want teaching as a career path. “Student teaching should come at the first, rather than the end of school,” Linda said. However, events caused Linda and Tom to grow up fast. When they were 25, Linda’s mother died leaving two young brothers, ages 8 and 11. They came to live with the young couple. It was time to settle down and provide for the kids. Linda ran a day care center and Tom went back to school. They eventually moved back to Oklahoma City so Tom could work on solar energy projects with architect Jon Robison. Linda started work as a secretary at Red Rock Behavioral Health Services and worked her way up to the Director of Administration. Although working at Red Rock was very rewarding, Linda wanted to diversify her resume, so she got a job as the Director of Development at the Oklahoma Foundation for Excellence. Later, she worked in the publications department of World Neighbors and at OU, where she was assigned to work in technical writing at the Department of Human Services. After that, she was able to go to Library School at OU, earning a Master’s degree and fulfilling a childhood dream. After completing her degree, she worked for the Oklahoma City County Metropolitan Library in Midwest City. Linda gives her time and talents to PAMBE Ghana and other worthwhile projects, including editing a quarterly textile newsletter for Weave A Real Piece (WARP). Additionally, Linda is a Master Gardener and spends a lot of time in her yard, especially propagating native plants. She still identifies herself as a weaver, although these days she mostly only does tablet weaving bands. She and her husband Tom enjoy traveling and are frequent tent campers and hikers. They travel to London a couple of times a year to spend time with their son, Blaise, his wife Melissa, Nicola, 9, and Quinn, 7. PAMBE Ghana is just one organization that has benefited by Linda’s boundless commitment to help others make their way in the world. Thank you, Linda!